In addition to the Special Feature, we have a two Open Access articles this month. The first comes from Paul Blackwell et al. and is titled ‘Exact Bayesian inference for animal movement in continuous time‘. In the article the authors develop a novel methodology which allows exact Bayesian statistical analysis for a rich class of movement models with behavioural switching in continuous time, without any need for time discretization error. The methodology allows for exact fitting of realistically complex movement models, incorporating environmental information. The second Open Access article is, ‘An asymmetric logistic regression model for ecological data‘, by Osamu Komori et al. In the article they present a method that can enhance the applicability of a generalized linear model to various ecological problems using a slight modification and significantly improves model fitting and model selection. We also have an applications article from Martin Mühling et al. : ‘OEZY: Optimising EnZYme selection for best performing terminal restriction fragment length polymorphism analysis using ARB‘. In this article, the authors introduce a new open source software tools which allows you to correctly predict the phylogenetic position of yet unknown sequence types by choosing restriction endonucleases that lead to a high correlation. On top of all of this, we have articles on Animal Movement, Stable Isotopes, Estimating Abundance and Ecological Networks. 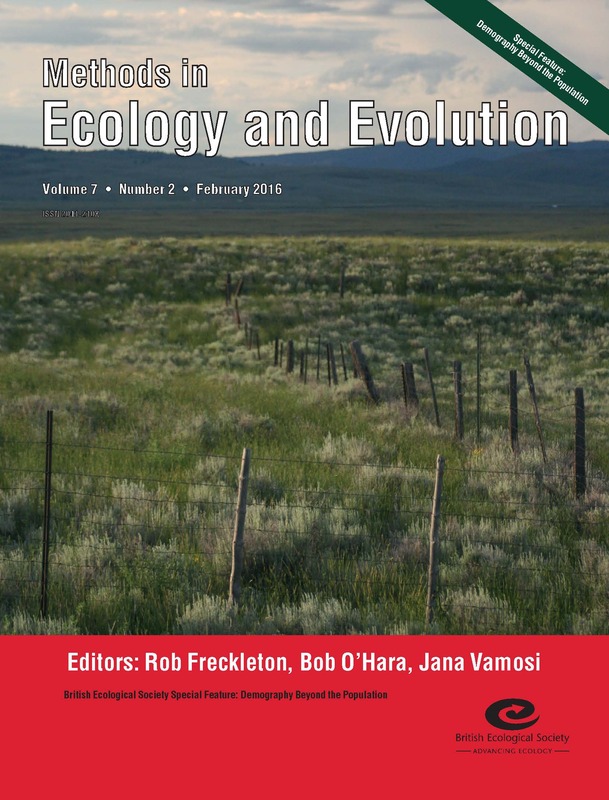 This month’s cover image shows sagebrush steppe in eastern Idaho, USA. In this community, population dynamics of the dominant perennial grasses and shrubs respond to both climate variation and competition. In the associated article, Linking demography with drivers: climate and competition, Teller et al. develop the use of spline methods that statistically link growth and survival data to high resolution competition and climate data. The authors demonstrate that spline methods can accurately reflect the spatial effects of neighbors and the temporal effects of climate covariates like precipitation and temperature. This entry was posted in Journal updates, Methods papers and tagged animal movement, Bayesian Inference, climate change, Demography, Demography Beyond the Population, Discretization Error, Ecological Networks, Estimating Abundance, Generalized Linear Models, Integral Projection Models, Inverse Modelling, Methods in Ecology and Evolution, Model Fitting, Model Selection, OEZY, phylogenetics, Plant, Population Dynamics, R, R package, Restriction Endonucleases, Sagebrush, Spline Methods, stable isotopes, statistics by Chris Grieves. Bookmark the permalink.